We bought our home on 06/2017. I was able to lock in a 4.0% rate for my 30 year mortgage. Up till now, I have been paying as per the 30 year schedule. I have read online that making additional mortgage payment is the way to go as it reduces interest payment and makes us debt-free early. But, is this really true? In this article, I explore various scenarios and try to identify the best scenario. For this article, I am assuming a mortgage of $100,000.00 at a rate of 4.0%. It should be easy to scale this amount for other values. By default, I will be assuming a 30 year (360 month) mortgage. It is very easy to obtain the mortgage amortization schedule online. For a 30 year mortgage (100,000 @ 4.0%) the monthly payment is $477.41 per month. At the end of 30 years the total payment would be $171,868.00 with $71,868.00 going towards interest and $100,000.0 going towards principal. In addition to the 30 year schedule we also do computations when additional mortgage payments are made. Additional mortgage payments go exclusively towards the principal and in the process they end up reducing the overall interest paid. 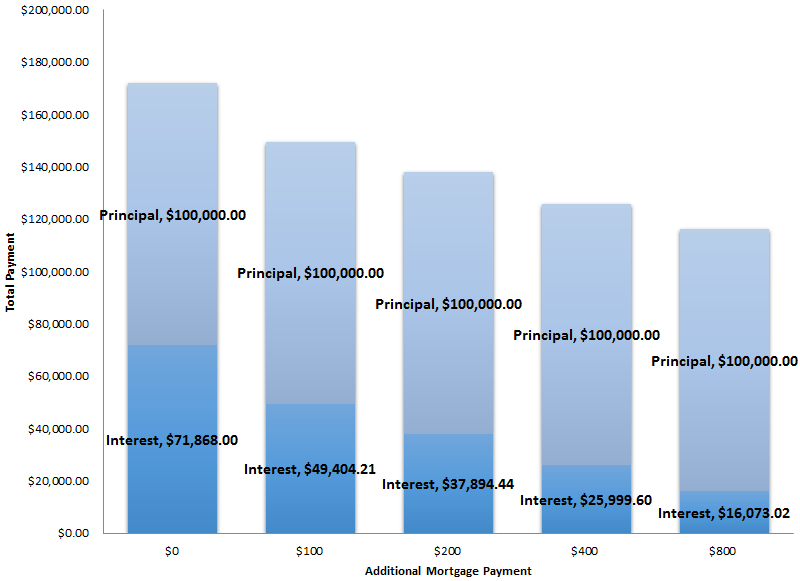 Let’s compute the total payments (interest + principal), considering $100, $200, $400 and $800 additional mortgage payments. 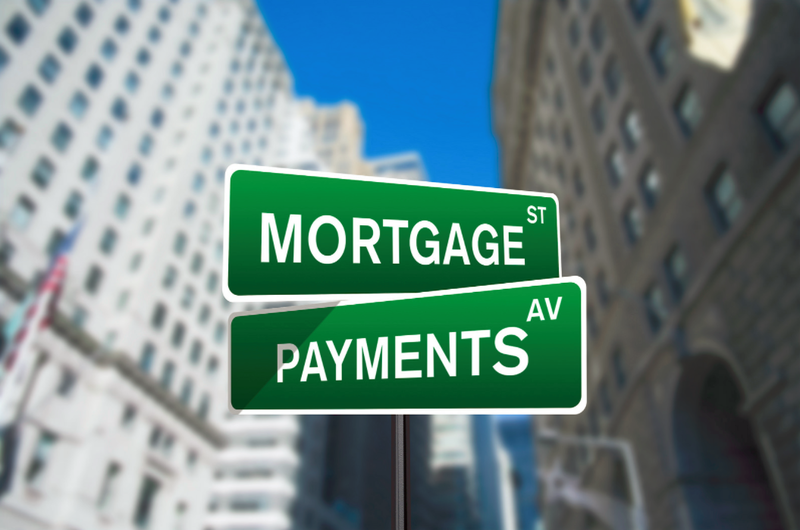 With each additional mortgage payment the interest payment reduces. Again using an amortization calculator we can easily compute the monthly payment. As expected with increased mortgage payments the overall duration goes down but the monthly payment goes up. Note: We assume that the fictional home owner has the ability to pay $1,275.53 towards mortgage. If he/she is unable to do it none of this analysis would make sense. The question is assuming it is affordable, should he/she be making this payment? Or should he/she stick to the minimum payment of $477.41. Even though the overall payment goes up, the good news is that a major chunk of it goes towards principal and not interest. It goes towards your home equity and unlike interest is not lost. 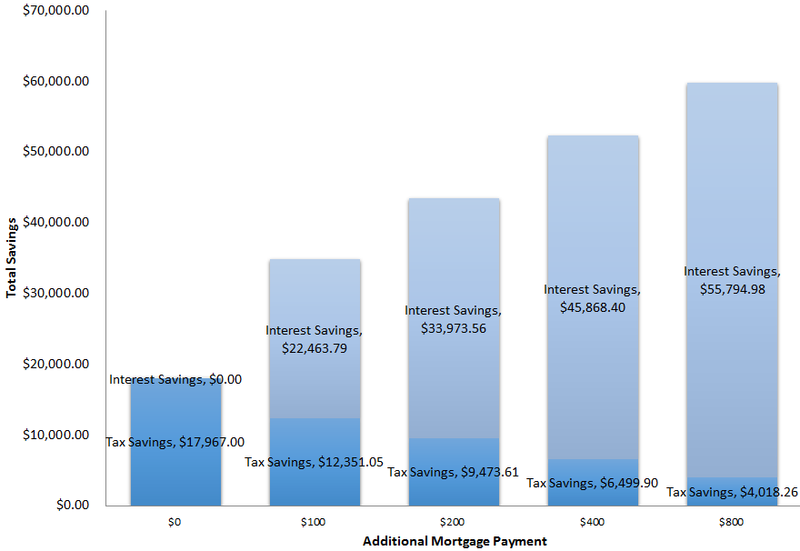 From the above graph the interest savings are quite obvious. Paying of mortgage saves us loads of interest. How about tax savings? For the purpose of this analysis I am going to assume a marginal tax rate of 25%. For someone buying a house at 30 and paying off mortgage at 60 a 25% marginal tax rate seems reasonable. I am going to assume the entire interest can be deducted via itemized deduction. With the new tax cuts/reforms this might no longer be true in certain states. Based on these assumptions the total savings are show below. So far it makes absolute sense to prepay mortgage as the additional savings are immense. Now let’s talk about the opportunity cost of prepaying mortgage. Our home owner could afford to pay $1,275.53 but he chose to pay only $477.41. That gives him a savings of $798.12 per month. What would he do with this? Let’s say he decides to invest the amount. For now let’s assume a 6% return on investment. In computing the compounded returns I simplify my calculations by assuming the amount is invested on a yearly basis and is compounded annually. Which basically means $9,577.40 is invested on a yearly basis with a 6% ROI and over a 30 year time frame. At the end of 30 years the value of this portfolio would be a whopping $757,171.79. We can do similar calculations for other monthly payments. For e.g. consider the case of $100.00 additional mortgage payment. 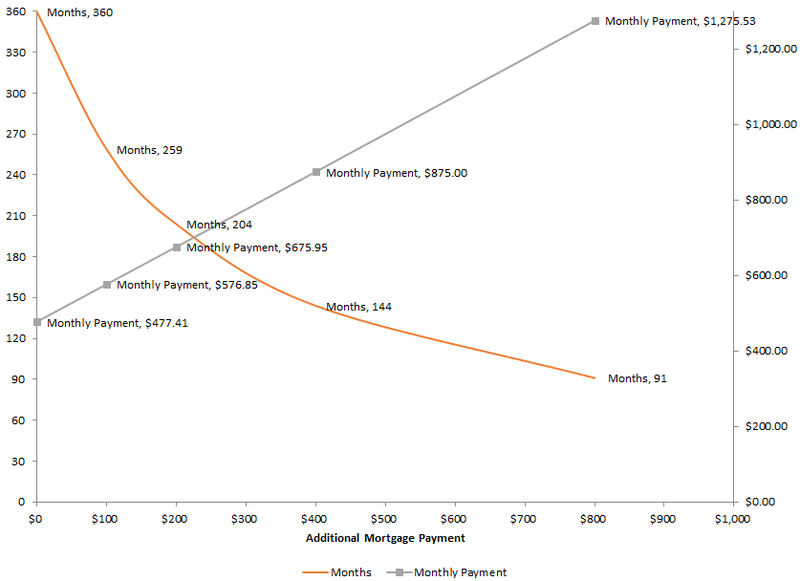 The amortized monthly payment would be $576.85 for 259 months. This basically means that for 259 months $698.68 ($1,275.53-$576.85) would be invested at 6% and for 101 months $1,275.53 would be invested at 6%. This is equivalent to $698.68 invested for 360 months at 6% and $576.85 invested for 101 months at 6%. This investment would generate a portfolio of $770,682.45 at the end of 30 years. I hope you are starting to see the picture. Even though the savings in interest is huge, the real dominant factor is investment returns. The best overall return is by keeping the mortgage for 30 years. This generates an overall return of $775,138.79. Why is this? It’s because of power of compounding. Even though the monthly investment is low it gets compounded for 30 years. In every other scenario the compounding time frame progressively reduces even though the actual invested amount is much more. Compounding time is the most dominant factor. I have also added an infinite scenario. In this scenario the mortgage is miraculously paid off on the first day. The entire amount of $1,275.53 (monthly) is then invested over 30 years. Obviously, this is the best case and would generate $1,210,093.06 in returns. Another way to look at is as ownership vs renting. But, then we need to take rent into account. 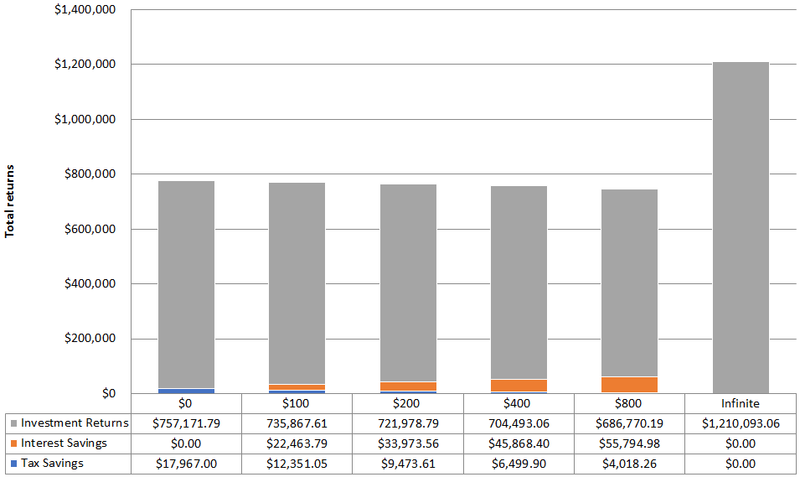 The differences in returns range between $4,456.34 (best and the second best scenario) and $28,555.36 (best and worst scenario). These might look like small numbers over a 30 year time frame. But, keep in mind this is only for a 100,000$ mortgage. As the value of mortgage increases these differences would be a lot more pronounced. We have assumed a 6% return on investment. What if this changes? Particularly if it drops below 4% i.e. the mortgage rate what is the impact? Each line in the above graph represents a ROI. As we move from left to right the additional mortgage payment increases. For e.g. 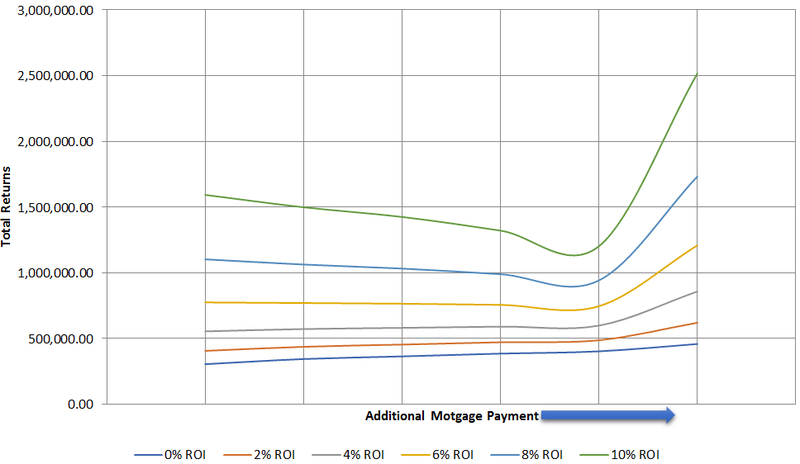 with a 0% ROI (dark blue line) it makes absolute sense to prepay the mortgage. That would provide us the best overall returns. Up to around 5% ROI it makes sense to prepay the mortgage. Starting at 6% ROI it makes sense not to prepay the mortgage i.e. make the minimum payment and invest the rest. The right most point refers to infinite prepayment (essentially the entire mortgage on the first day). The closer we are to that point the better our returns is. In conclusion there are two best case scenarios. (1) pay off the mortgage over a 30 year period and (2) aggressively pay off the mortgage as soon as possible (trying to stay as close to the infinite point as possible). Aggressive payoff is not that easy. Even with $800.00 per month additional payment it takes 7.5 years to finish off the $100,000 mortgage. There was an interesting comment by Passive Income Pursuit about the effect of inflation. I decided to look into it and it seems like this might be one of those rare occasions where inflation is beneficial. I used CPI (Consumer Price Index) to compute the value of a dollar in 2017 in terms of its value in 1987. By spreading the payment around 30 years the effective payment (in real dollar) comes out be $79,669.28. An overall savings of 53.65%! Up until now we have only looked at the math behind the madness. Mortgage is a lot more than just mathematics. It has an emotional aspect to it too. The emotional aspect is associated with carrying debt. All of us want to be debt-free (psychologically) and keeping a mortgage for 30 years is not something we would be happy about. Another emotional aspect is interest payment. The fact that we would end up paying a lot more in interest would make us unhappy. This is in spite of the fact that mathematically we would come out on the top overall (investment returns – interest). The reason is interest payment is immediate and seen on monthly statement. Whereas the investments returns are spread out over years and not seen immediately. That is why I call it as opportunity cost. In the computations we needed at least a ROI of 5% to come out on the top. Knowing that this over a 30 year period, average returns on the stock market could easily net us this return. But, what if it does not? Again, it comes down something immediate vs something in the future. Interest payments are immediate and investment returns are in the future (one bird in hand is worth two birds in the bush). Contributing additional mortgage payments provide immediate return on investment. Stock market provides better returns with higher risk. If this additional risk is not acceptable then it might make sense to direct additional capital towards mortgage. Another disadvantage of early payment is lack of liquidity. Stock investments provide much more liquidity than home. HELOC might provide some respite. Home price might go down. A major chunk of your net worth would be from your home i.e. lack of diversification. Conclusion: Since my mortgage rate is 4%, I plan spread my mortgage payments over the next 30 years. I don’t have the kind of capital to make an aggressive pay off scenario work. Rest of the capital I plan to invest in low cost index funds. With this investment strategy I think I can get a 5% ROI over a 30 year time frame. Hopefully, in 30 years I will come out on top. What are your thoughts? Please feel free to share them in the comments section. I went with paying off the mortgage. It was the bird in the hand is better than two in the bush theory. It's a guaranteed win and I sleep better at night knowing I have zero debt and a place to sleep. In saying that you will probably come out ahead by keeping the mortgage and investing the rest. Agreed. Like I mentioned that is the emotional path. I do the same with index investing. Helps me sleep better. Thanks for your comment. I'm with the above two readers. Personally, I can tell you that paying off the mortgage was the best investment I made. The emotional security one gets from not having to worry about rent or monthly mortgage payments can't be calculated mathematically. It's something you just have to experience to appreciate it. Not only you get a guaranteed return in terms of savings on your interest, but you also get an investment (home) that is insured. One major flaw with the mathematical comparison is that 30 years is a very very long time and most people are not disciplined enough to regularly invest or not make investment mistakes. Markets can also see multi-year decline or even recession that can last 5-7 years easy. So stock market returns are no sure thing. On the other hand, you could actually live in the same house for 10,20,30+ years, no problem. As long as you are not fidgety type who wants to move around too much. We have lived in our current house for about 12 years now and we paid it off 4 years ago. We plan to stay here for another 10 years or as long as we are fit to do the yard work ourselves. It's a great feeling to own your house, free and clear. No math can explain it. That's all I'm gonna tell you. I agree with most of what you said. Stock markets returns are no sure thing. But, since we are looking over a 30 year time frame surely the returns would be above average. Like you mentioned 30 years is a really long time. Secondly, investing mistakes can completely avoided by picking index funds. Thirdly, an additional component is dividends which can be used to pay off the mortgage earlier. PIP mentioned inflation ... surely spreading the payment across 30 years at fixed rates will save you a lot more in real dollars thanks to inflation. There are definitely more unknowns with this strategy and having a payed off mortgage is definitely safe and desirable. In which case the idea is to aggressively pay off as soon as possible. An intermediate strategy seems to be the worst. Really love the blog post. The best thing about them is all the great stats and analysis you put into them. Really backs up what you are saying. I would have thought paying of a mortgage early would save money but you have convinced me otherwise. We do both, paying off our mortgage and investing in the stock market. Part liquidity and part emotional we have the best of both worlds albeit slower. That seems like a sound strategy. I would probably use my dividends and capital gains to make additional mortgage payments. Excellent post Geek and thanks for the information. I also like the comments so far. I bought my house a little less than two years ago. Initially when I lived in it, I had roommates to help cover the mortgage. Now that I moved out, the house is rented. The rent completely covers the mortgage and property management fee. I used to get back $250 per month but now, it's somewhere around $150 in positive cash flow. I'm sure vacancy for a month or two will wipe out profits, but we will see. I think it's in a good location in a market that attracts good tenants. Anyway, when I purchased the house, I struggled with the decision of whether I should try to pay it off early. I toyed with the idea of doing a bi-weekly mortgage as I'm currently under a 3.5% fixed interest rate for 30 years. I chose not to do the bi-weekly option. Then I thought I could just make an extra payment every year to help pay it off faster - the virtual equivalent of a bi-weekly option. Well, I haven't done that either. Something about discipline. I'll try to keep this comment short. So, I decided that I'm just going to let my tenants pay off my mortgage over that 30 years. And, your analysis helps reassure me of that decision. Because all the money that I would be using to pay off the mortgage is instead being used to invest. Plus I'm unsure how long I'm going to keep the house for anyway, and that's also a factor to consider. Regarding the emotional decision about paying off the mortgage, I absolutely can't argue there. There are pros and cons to either decision and there's no one right way to do this. Really good post Geek. Thanks DP. You can never go wrong with renting out. It really does not matter if its over 30 or 15 years as long as someone else is paying for it. If you can maintain consistent occupancy your strategy works. Something to definitely consider. I missed that part in my article. True about how long one plans to hold on to the home. If it is purchased as an investment property I guess its a different story. Thanks again DP. It depends on how much risk you want to take. The Mortgage is a guaranteed 4% return and as long as it's on your books, acts as a kind of reverse bond. I don't have a mortgage yet but once I do, I'll probably try to pay it off faster than 30 years just because I'd prefer having no debt earlier than 30 years from now. True! But like PIP mentioned inflation can help you reduce the real dollars you pay towards mortgage. This is in addition to the investment returns I mentioned. If you plan on paying it off early then go aggressively into it. From a purely mathematical standpoint investing is going to come out on top if you got a mortgage sometime in the last decade or so. Our interest rate is a bit high, but still low enough to have a fairly low hurdle rate just under 6%. As long as our investments can beat that over the long run then we'll come out ahead. If you're already saving and investing aggressively then "diversifying" by paying down the mortgage is probably a good idea because like you said the extra payments are a guaranteed "return". The psychological factor plays a big role though and I completely understand the draw of not having that big debt and accompanying payment. Our current approach is to save and invest as much as possible and then somewhere down the road we'll swap to aggressively paying down the mortgage. I think that's kind of a best of both worlds situation as long as the timeline for the switch isn't extremely long. You get the benefit of longer compounding time for your investments and still get the mortgage paid off early. One last thing since this comment is getting lengthy. Inflation is something else to consider too. Since your mortgage payments are at a fixed price over the life of the mortgage dollars spent in the future, say 10 years from now, have less buying power than dollars today. So your mortgage, assuming your income goes up with inflation, gets "cheaper" each year. PIP! Your point on inflation was awesome mate. Never thought of that. I like your strategy. I might end up with something similar i.e. use my capital gains and dividend to pay off my mortgage. Great analysis, and I completely agree. From a cold, hard numbers perspective I think it makes way more sense to take the low interest loan from the bank and continue investing in the market instead. This is the path I'd choose. But I can understand from an emotional perspective, there's just something to be said about not owing anything. While mathematically you'll most likely come out ahead in the first scenario, you're still rolling the dice. I know my wife is much more comfortable paying down the mortgage. I like doing it both ways! A nice balance of both approaches. I was paying off my mortgage (an extra payment a month) and a few more lump sum payments but now just focusing on using the extra cash to invest. Having more money for liquidity is nice instead of having it locked up in the home (even though there is the option for a HELOC). I am kind of veering towards a similar approach. Perhaps I can use my gains as extra mortgage payment? or even better use my dividends. I've thought about taking tax return money for extra payments. But I'm still young and the market seems so much more attractive in so many sectors. Maybe I should consider some type of split. Ha! that's a very difficult question to answer. The general trend seems to be payoff the mortgage or use an hybrid approach. I agree with the approach of investing the money, rather than directing it towards an accelerated mortgage repayment. As the math shows, it's more likely that you'll come out on top, over time. I also like the liquidity aspect you mention. Unexpected things can happen, and money may be needed. A HELOC is certainly an alternative, but requires the foresight to have established it in advance, and the discipline to not use it. I tried to do a little bit of both but focused on my mortgage primarily. I really enjoy being mortgage free! Mostly when the market is acting up! True! 2008 was not a good time for housing market either. Uncertainties happen both ways and probably impacts us equally. Having a house in a downturn provides a roof for free. Have a dividend stock helps us through times. Need both. I see both sides. My thinking has been like yours. But with a family I think of a few different scenarios. Where paying the mortgage is better. 1. Would you ever take a mortgage to invest? I don't think most sound financial planners would ever suggest that. That is a statement I keep coming back to. 2. A life changing event that aligns with a downturn in the market. 3. Probably doesn't apply to you, but discipline. Some people aren't as disciplined about investments as they are debt. If you are married is your partner going to be able to treat investments like a mortgage payment. 4. Posterity. While you are right investments provide more liquidity. That could also be dangerous. If they aren't prepared to handle the windfall. Or aren't as disciplined about investing. True DS. It is a calculated hedge ... I don't see it as taking a loan to invest. That being said it is cheap credit. BTW, look at my graph on effect of inflation on mortgage dollars. Overall I am inclined to say paying early is purely emotional. But, I agree with your points too. A life changing event can impact us on multiple fronts. I have had a discussion with my spouse, we don't have agreement yet. The math clearly favors your approach in most instances.It is predicated on having the discipline to invest what you say your going to invest. And it's not without risk. For me the X factor is my wife. She's not a materialistic spender. But she doesn't have the same sense of urgency around savings. Little things like carrying a small credit card balance instead of paying it off. Putting money in the bank as opposed to the market. Wanting to replace a car before it is necessary. I'm not perfect either. But the question for me becomes is the money saved by paying the minimum mortgage payment all going into investments, or will there be leakage into spending? When It comes time to take your kids to Disney World, is it easier to forgo a monthly investment than it is a mortgage deduction? That is the other X factor. Yes, I agree with your point. Sometimes money has better use then just investing or mortgage payoff. Thanks DS. Lots of great discussion in the comments though, like most of these financial decisions it's really driven by personal preference and risk / comfort. The only problem or concern is the interest keeps going down. If you start aggressive payoff after 15 years ... the amount of interest left over is really not much. You are truly better of investing. Either way requires lots of thinking and quite a few opinions in the comments section. I went ahead and paid off my mortgage fully. My reasoning is if you ran paying off extra only for a few years and see how much you can save on interest is much more. Interest that you save in early years is much greater than later years where the value of you $ will be reduced due to inflation. Also, I am not sure for your case, but for most cases, interest paid is never fully deductable, even with itemized deduction. The calculation must be performed based on the case as if you didnt have any interest to be paid for the year, you will still be using itemized deduction without needing to pay a penny towards the interest payment on your mortgage, therefor, only the portion of interest paid above and beyond your standard deduction make sense to be considered in the calculations. and Last but the most important, once you pay extra towards the mortgage, you are saved the interest, the deal is sealed. In other words, that's your realized gain versus assuming 5% or 6% is only an assumption and not realized. I am not saying that you won't get there but there has to be value associated with the certainty versus uncertainty in investment. If debt is really that good, then might just take loan from bank (student loans are about 4%) and use the money to invest instead of paying off loan, just saying. Just my thoughts not necessarily true for all. I say, if you are convinced somewhat with these thoughts then pick something in middle or reevaluate your situation to see if in your case makes any sense to reduce debt. Also, your 5% return will be taxable unless its in IRA accounts. Currently I am investing everything I can every month since my expenses have gone down on monthly bases. So putting things in perspective, snow ball effect on investment after mortgage is paid off or partially paid off also goes a long way. I know each situation is different and unique so its so not so easy to make a decision one way or the other but in my books, 70k interest on 100k debt is massive, out of 70k most interest is typically paid in first 1/3 debt term years. Well your technique can definitely work. Aggressively paying of the mortgage and then investing is a sure shot way to maximize returns. It makes sense to pay a lot more in the early stages of the mortgage and then reduce payments to minimum. As you mentioned it would be mostly principal at that point. Nice one TDK.